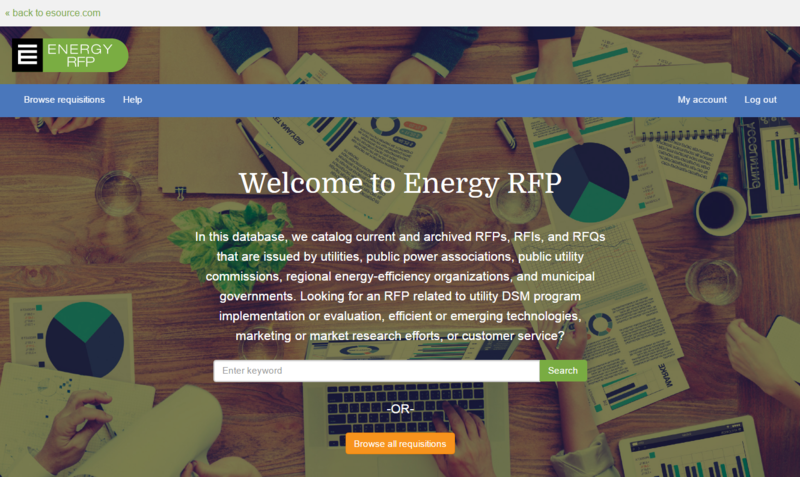 Energy RFP is a searchable, interactive database that catalogs hundreds of current and archived RFPs, RFIs, and RFQs issued by utilities, public power associations, public utilities commissions, regional energy-efficiency organizations, and municipal governments. Whether you’re a utility looking for examples of RFPs to guide your own RFP development, or you’re a DSM program implementer or evaluator looking for open RFPs to bid on, this tool is for you. Energy RFP enables you to save relevant requisitions and quickly revisit ones that you’ve recently viewed. In some cases, you can even learn which vendors won closed RFPs. Whether you’re trying to get your RFPs in front of vendors, you’re looking for new business opportunities, or you want to identify trends and best practices in utility and energy RFP creation, Energy RFP can help make your job easier.